Over a career spanning four decades, Ernest Hemingway (1899-1961) created a body of novels and short stories whose style had enormous influence over later twentieth-century authors. Though Hemingway’s spare, bare-bones prose was often parodied, it appealed to readers and earned him the Nobel Prize for Literature in 1954. 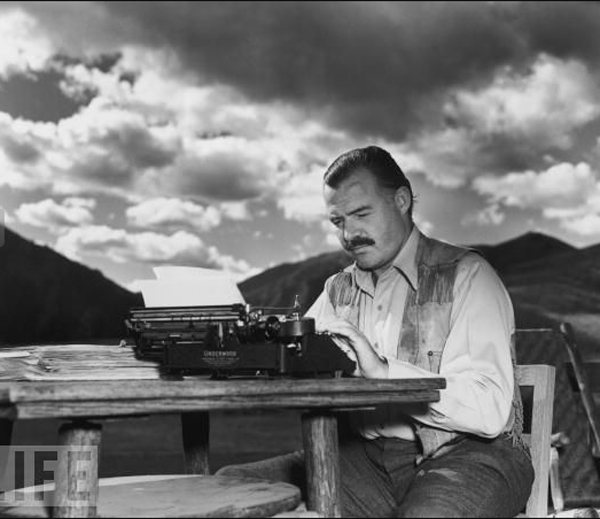 The Illinois-born Hemingway began in journalism, working as a reporter in Kansas City, Missouri. When the United States entered World War I, he served as an ambulance driver in Italy and then stayed in Europe after the war to live among a community of expatriate American writers in Paris. Comprised of Ezra Pound (1885-1972), F.Scott Fitzgerald (1896-1940), John Dos Passos (1896-1970), and others, this group – which Gertrude Stein (1874-1946) later termed the Lost Generation – created a rich outpouring of literature during the 1920s. The Sun Also Rises (1926), Hemingway’s first significant success, is set among this community of dissipated American expatriates in France and Spain. A Farewell to Arms (1929) and For Whom the Bell Tolls (1940), two tragic wartime love stories, stemmed from Hemingway’s experiences during World War I and the Spanish civil war, respectively. His later masterpiece, The Old Man and the Sea (1952), tells a moving parable about an elderly fisherman. Over the course of these works, Hemingway developed a distinctive prose style, featuring repetitive, unadorned sentences in which the spaces between the words – what is not said – are as important as what is said. Hemingway’s works attracted renown – and at times mockery – for the overt, self-conscious masculinity of their subject matter. Indeed, the majority of them feature stoic male protagonists, many engaged in endeavors such as war, bullfighting, boxing, and hunting. Hemingway’s legendary globetrotting lifestyle – including everything from safaris in Africa to big-game fishing in Cuba – supported this reputation. Nonetheless, crippling depression set in during Hemingway’s later years, and after a period of declining health, he took his own life in 1961. This entry was posted in Biography, Writers and tagged blog, blogging, Books, Culture, education, Ernest Hemingway, history, life, Literature, Miscellaneous, writers. Bookmark the permalink. Many writers from that era worked in an unadorned style. I did some study on the hard-boiled detective writers in the early to mid-20th century and found the prose to be wonderfully direct, with the very best of these writers, Hammett, Chandler, Himes, saying a tremendous amount in a few words. They set a standard by which many present writers are still compared. I love the writing style of Hammett and Chandler. I have always had an affinity for Erle Stanley Garder.